Quirky and definitely idiosyncratic, A la Ronde radiates a sense of otherworldliness. There is probably no other house quite like it on earth. Resting humbly on a hillside, not far from Exmouth in Devon, it is certainly not a classically beautiful, commanding edifice. Indeed, the house might befit the dwarf sized hobbit folk who feature in J R R Tolkien’s children’s fantasy The Lord of the Rings. It was the Misses Jane (1750-1811) and her cousin Mary Parminter (1767-1849) who gave rise to this extraordinary residence and its grounds upon which they also built a chapel, manse and almshouses. (Jane, incidentally, was Mary’s guardian for over a decade.) Jane was the daughter of a prosperous Devon merchant based in Lisbon, where he first owned a wine export business and later diversified into the cement manufacturing business after the great earthquake in Lisbon of 1755. Jane was brought up in Lisbon and in London. Mary came from a West Country family of landowners and wealthy merchants. When her father died in 1784, Jane and her sister, Elizabeth, Mary and a female companion, a Miss Colville, embarked on an extensive European tour. Elizabeth, alas, died upon the women’s return in 1795. It was likely that Jane’s married sister, Marianne Frend, encouraged the cousins to settle near her home in the fashionable sea bathing resort of Exmouth. Being independently wealthy, Jane and Mary could purchase some 20 acres of land in the region. Their site afforded lovely views overlooking Exmouth and the Exe Estuary. 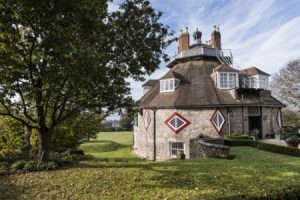 The most distinguishing features of the house they created are its sixteen sides, linked circularly, and the conical roof (now tiled but originally thatched) with a white painted balcony and cupola atop. The fenestration of the house, originally and even now, is peculiar, too. What remains of the original are the red-bordered diamond shaped windows and the angled green shuttered sashes. Centred inside is an octagon shaped central hall, reaching up from the upper ground floor to the first floor. Originally the surrounding rooms were connected to each other by ante-rooms; now only some of the lobbies remain. 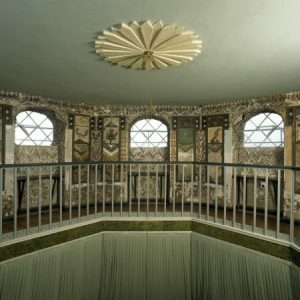 The octagon’s walls are painted decoratively with a chevron pattern, most likely conceived of by the Parminters. In between the upper ground floor doors are Mary Parminter’s octagonal-shaped seats with triangular backs, topped with a small octagon shape. Above the octagon is an extraordinary gallery. The outer wall, painstakingly created by the cousins, is covered with fantastical designs of shells, feathers, seaweed, sand, glass, quartz, quillwork and bones. The materials were gathered from neighbouring woods, fields and the seashore. The Parminter technique entailed sticking materials on card before this was attached to a plaster surface. Other materials were pressed into the lime putty skin that covered a coarser pink plaster before it set. A steep, narrow staircase leads to the gallery, along which there are window recesses, encrusted with decorations such as one finds on the gallery outer wall. In the drawing room there is an impressive ‘Parminter’ feather frieze made from feathers culled from native game birds and stuck down in a series of concentric patterns. In the library, the breakfront of the mahogany bookcase in the library looks as if it will burst with the cousins’ souvenirs: shells, beadwork, semi precious stones and votive statues vie for space on papered raked shelving. You might want to take home the cousins’ tiny eighteenth century bookcase holding a collection of miniature Regency school textbooks. The cousins’ decorative interests were shared by other middle and upper class men and women in the 18th and 19th centuries, who also created large and small-scale pictures and designs using unusual materials. Alexander Pope’s grotto, created in the early 18th century, near his Twickenham villa, was first finished with shells and pieces of ‘looking glass’ and later transformed into a ‘museum’ of mineralogy and mining, using ores, fossils, crystals, a stalagmite, flint, shells, Bristol and Cornish diamonds, marble, alabaster, snakestones and sponge stones and a section of the basalt Giant’s Causeway. At Goodwood House, near Chichester, there is a Shell House, with over 500,000 shells (the Shell Gallery at A la Ronde is believed to have about 25,000 shells), which was created over seventeen years by Sarah Lennox, the 2nd Duchess of Richmond, and her daughters, Caroline Fox and Emily Kildare. Shells fascinated the Duchess of Portland (1715-1785), who determined to collect examples of every known molluscan species; she managed to collect at least 20,000. Mary Delany, a very close friend of hers, is well known for her shell and needlework, as well as her botanical drawings. Thinking of the small scale, after collecting sea shells or buying packets of shells, many ‘genteel’ women would use them to create pictures of birds, animals and people or dress dolls, chandeliers, boxes and vases, picture and mirror frames. One would dip the back side of the shells in hot wax and attach them to the object being decorated. It’s most likely, suggest most sources, that Jane conceived of and designed A la Ronde, as the inspiration for the quaint abode is believed to be the sumptuous, many sided, sixth century Byzantine Basilica of San Vitale in Ravenna, and its vaulted octagonal tower and splendid mosaics. The Parminter and Colville entourage would certainly have appreciated it during their tour. Others believe the house is the brainchild of a Commander John Lowder, a property developer who built Lansdowne Place in fashionable Bath, or possibly his young son, John Lowder, an aspiring architect. The actual ‘builder’ could probably have been either the father or the son; they both would have had the practical skills to undertake A la Ronde’s construction. Undoubtedly, Jane and Mary would have designed the interior. Could one imagine otherwise? The grounds, now simply landscaped, were originally elaborately landscaped and ornamented. A quarter of a mile away from A la Ronde one finds the “facilities for private devotions,” as the Mary Parminter Charity, otherwise known as “Point of View”, describes the manse, chapel and almshouses, completed in 1811. The ‘complex’ is another example of the distinguishing interests of Jane and Mary Parminter. They determined that non-conformists would use the chapel for worship. (Mary’s grandfather and a cousin of hers had been dissenting preachers.) The Trust notes “although of non Jewish extraction, the two spinsters evinced a lively interest in the conversion of Jews to Christianity prior to their promised return to Palestine. This was their ‘point in view’ ”. Mary Parminter specified that the residence should be occupied by a “Minister of the Gospel…a Protestant Dissenter…” , four single approved women over fifty years of age should live in the apartments, and a schoolmistress should be appointed to teach six poor female children. A Jewess who has embraced Christianity shall be given preferential treatment, and “the children of Jewish parents shall in all cases be preferred”. Nowadays the church, which holds services regularly, is associated with the United Reformed Church. The schoolroom is used as a vestry; there is a meeting room and a new kitchen; both male and female residents are housed in five bungalows on site. Were Jane and Mary proto feminists? (The word was not in use during their time, and the movement was but a dot on the horizon.) It is quite likely that there would not have been a shortage of suitable men to marry in Jane and Mary’s social circle. Potential partners would have regarded the women’s independent wealth as an asset. So it’s likely that instead of choosing to live within a patriarchal domestic setting, they opted to enjoy a companionship between equals and engage in exceptionally individualistic craft and charitable work. Would their pursuits have been realisable in a traditional ‘Victorian’ domestic setting? Furthermore, Mary’s will stipulated that the estate must be preserved intact, and that only unmarried kinswomen could inherit. Changes in the law allowed one heiress to break the trust and transfer the property to her brother, the Revd. Oswald Reichel, the only male owner the house has ever had. (Was she pressured to do so as she was unmarried and he had a wife who might bear children?) Reichel made several modernising changes; his marriage was childless. It was the ultimate heir Ursula Tudor Perkins who arranged for the National Trust to purchase the property; maintenance was cumbersome and costly. Had Jane and Mary been living in the early 20th century, it’s conceivable that they might have supported the peaceful suffragists. One can see them establishing a worker’s guild, à la Mary Seton Watts, for women practising shell craft. “Votes for women” could have been written in shells. 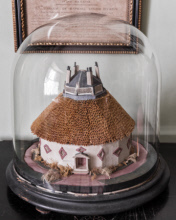 The first image reveals a model of the house underneath a glass bell jar; the second photograph shows the exterior of the house. Both pictures © National Trust Images/Andreas von Einsiedel. The third picture shows a zig-zag shell frieze above a clerestory of eight diamond-paned windows with shell encrusted recesses. This view looks across to the wooden railings showing the plastered circular light fitting on the ceiling.© National Trust Images/David Garner.